With the 2018 NFL season quickly approaching, many teams are hoping to see improvement in their offensive lines, while some are looking to maintain their success from a year ago. No offense wants to be one-dimensional, so having linemen who excel in both the pass and run game has become increasingly sought after. With that said, let’s look at the league’s balanced offensive lineman across every position by using their PFF grades from the 2017 season and who of those players ranked inside the top 20 in both run-block grades and pass-block grades. The Steelers have plenty of well-known offensive weapons and DeCastro proved to be as important as any of them in 2017. The former first-rounder continued to impress a year ago by posting a career-high overall grade of 91.7, which ranked second not only at the guard position but among all offensive linemen. DeCastro was also one of only two linemen to finish top 10 in both pass-block and run-block grades last season. With grades of 88.9 in pass-blocking and 90.6 in run-blocking, the Steelers guard ranked fifth overall in both categories helping pave the way for the Steelers explosive offense. 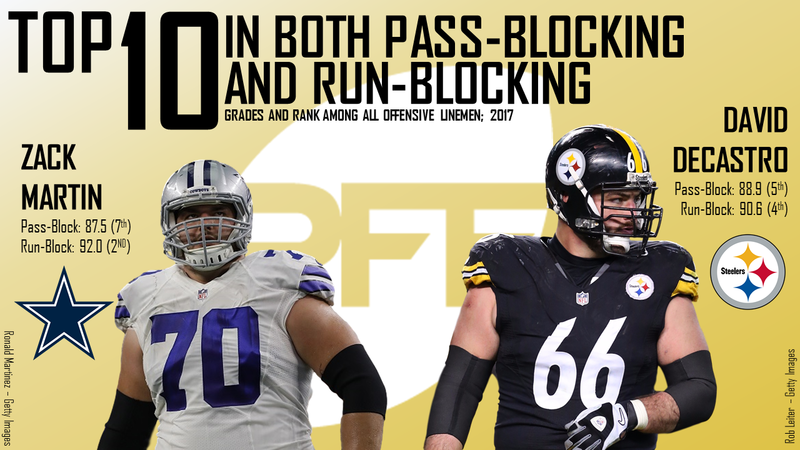 Throughout the season, DeCastro only allowed 16 total pressures (14 hurries, two hits, no sacks) earning him a pass-blocking efficiency rating of 98.2. DeCastro also showed once again that he’s as durable as any lineman in the NFL, playing 1,125 total snaps (698 in pass protection, 427 on run plays) all while maintaining an elite overall season grade. The Cowboys offensive line has been well recognized as one of the stronger units in the league for some time. When you look at why, look no further than their starting right guard in Martin. It’s no secret that Martin was one of the league’s top guards coming into 2017, but he took his game up another level this past season. After posting overall grades of 85.9, 89.0, 88.6 in his first three years in the league, respectively, Martin led all offensive lineman in overall grading for the 2017 season at 92.2. Martin finished the year with the league’s seventh-best pass-block grade (87.5) and second-best run-block grade (92.0) joining the aforementioned DeCastro as the only other lineman to finish top 10 in both categories. Rounding out his great season, Martin also had a 98.4 pass-blocking efficiency after only allowing 11 total pressures all year (nine hurries, one hit, one sack). Potentially the most impressive number of all, Martin did this while not recording one single penalty over the course of 1,018 snaps played. The 27-year-old guard is in the prime of his career and should be ready for another elite campaign in 2018. It’s no surprise the reigning Super Bowl Champion Philadelphia Eagles had great offensive line play in 2017, but their most balanced lineman was not the one most expected. Their starting right guard in Brooks ranked in the top 15 of both pass-block and run-block grading while posting an 88.3 overall season grade. It was a career year for the former third-rounder out of Miami (Ohio), grading as the eighth-best lineman overall while playing a career-high 1,279 snaps. Brooks tallied a 97.7 pass-blocking efficiency rating, highlighted by the fact that he did not allow a sack all season. 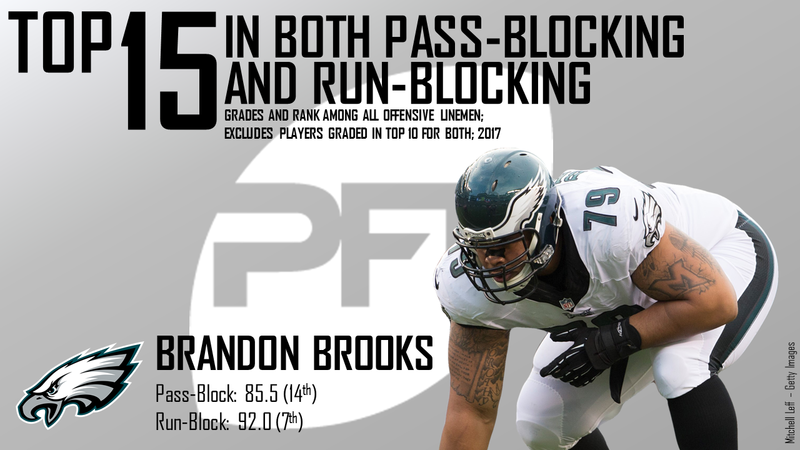 Now going into his seventh year as a pro, expect Brooks to continue to be an important piece of the defending champion’s offensive line unit. In his 11th season with the 49ers, Staley finished in the top 20 of both pass-block and run-block grading. His 87.4 overall season grade ranked him second among all offensive tackles and was also the third-highest grade of his career. Playing a total of 983 snaps (606 in pass protection, 377 on run plays), Staley finished with a pass-blocking efficiency rating of 96.7 after allowing just 24 total pressures. Staley’s 87.6 run-block grade ranked first among all offensive tackles and ninth among all offensive linemen. Even with the veteran turning 34 years old before the season starts, if 2017 is any indication, he’s more in place to be an integral part of their offensive line than in a spot for potential decline. Norwell’s career year in Carolina came at the right time for the fourth-year guard, who was entering free agency after the season. 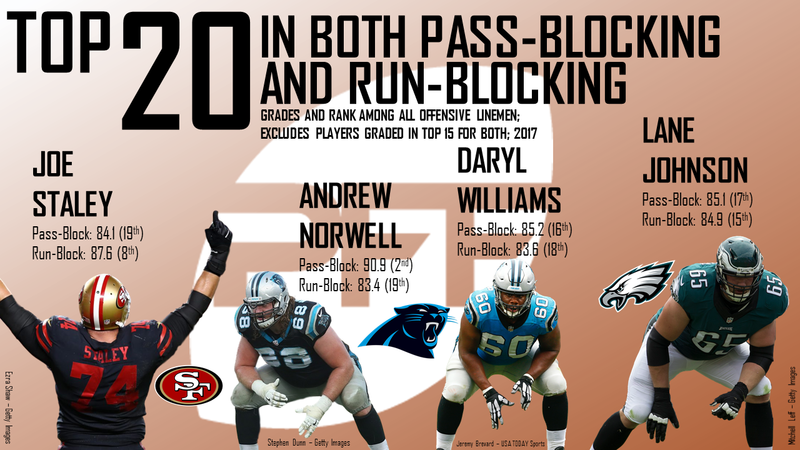 Norwell ended up finishing top 20 in both pass-block and run-block grades in his final season with the Panthers, earning him a lucrative five-year contract with the Jaguars. Norwell excelled in the passing game, finishing with a pass-blocking efficiency of 98.2 while ranking second overall in pass-block grading among all lineman. He was also one of only five linemen in the league to not allow a single QB hit or sack during the season. Johnson rebounded well from two seasons ago when he only played six games of a suspension-shortened season, to play a total of 1,116 snaps in 2017. In addition to registering a 97.2 pass-blocking efficiency rating, Johnson was integral in keeping Nick Foles upright during the Eagles’ postseason run not allowing a single sack but only yielding five total pressures over three playoff games. After finishing in the top 20 of both pass-block and run-block grading, Johnson should see continued success going into his sixth season with the Eagles. The Panthers’ Williams showed tremendous improvement in 2017 earning an overall grade of 86.5. The former 2015 fourth-round pick had a breakout season as a full-time right tackle, finishing in the top 20 of both pass-block and run-block grading while compiling a 95.2 pass-blocking efficiency. With the loss of the aforementioned Norwell, Williams becomes the anchor of an offensive line unit responsible for protecting Cam Newton, who struggled mightily when pressured a season ago. If he can piece together another strong year in 2018, Williams should see a nice payday as he’s set to hit the free agent market at seasons end.